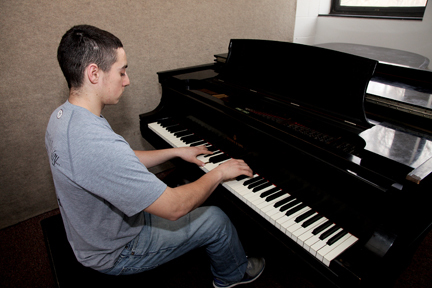 Pianist Jonathan Cohen ’14 executes expert improvisation on the Marks piano during the lunch hour practice period. “The piano is very smooth and clean; it doesn’t stick. Very easy to play,” Cohen says of the instrument that once served jazz great Bill Evans. Practice Room 426 in the Lang Music Building is the new home to a beautiful old Steinway grand piano, a gift to the College from Anthony Marks ’81. According to Bernadette Dunning, the administrative coordinator in the Music Department, student pianists vie to play the lovely old instrument and enjoy its rich tone. No less rich is the history of the piano and the serendipitous path that brought it to Swarthmore. The piano, built in 1923, long served influential American jazz pianist and Down Beat Jazz Hall of Fame inductee Bill Evans as his recording piano. In a message to Dunning, Marks wrote that his father, Lawrence Marks—an amateur jazz pianist who had played with Billy Holiday, Al Haig, and Dizzy Gillespie—purchased the piano in 1972 from the New York studio where Evans had made several of his recordings. Ten years later, it was placed in storage with the Steinway company, from where Marks retrieved it in 2004. “This piano meant a great deal to my father. 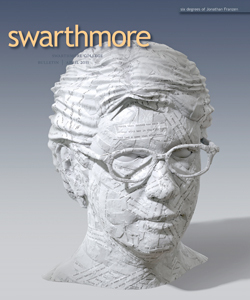 It would be wonderful if it could find a place at Swarthmore,” Marks wrote, proposing to donate the instrument. The piano came to the College in December 2009. It was first placed in the home of Cornell Distinguished Visiting Professor and renowned jazz pianist Hans Lüdemann. At the end of Lüdemann’s yearlong tenure on campus, the piano was moved to Room 426. It bears a plaque above the keyboard, identifying it as “The Marks Piano (a Bill Evans recording piano) given by Anthony Marks ’81 in memory of his father, Lawrence Marks, J.D., M.D., December 2009.” A restored photograph of Bill Evans playing the piano is displayed in the room.